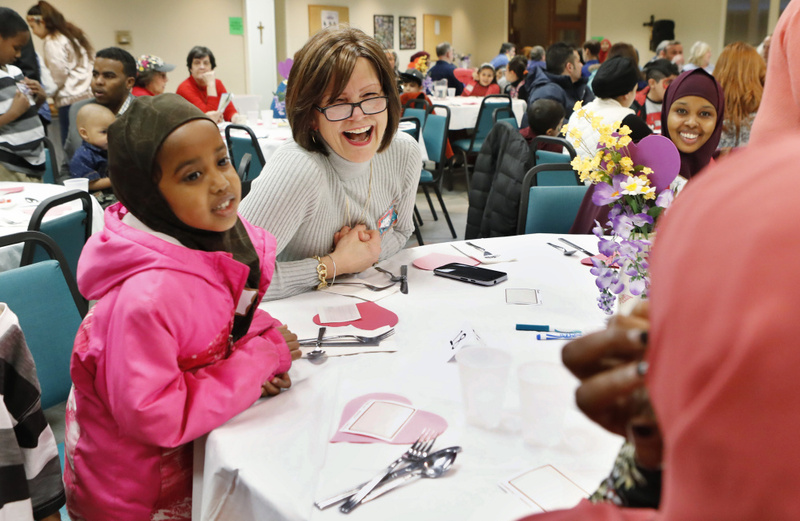 Parishioners of St. Maximilian Kolbe Roman Catholic Church host a Building Bridges dinner to promote understanding between natives and immigrants. SCARBOROUGH — Sharing a meal to promote good will and understanding is a practice as old as humanity itself and one that is threaded through ethnic and religious traditions around the globe. Jesus Christ perfected what is known as the table ministry, regularly inviting people of all stripes to share food and hear his words, right up to the reckoning of the Last Supper with his closest followers. 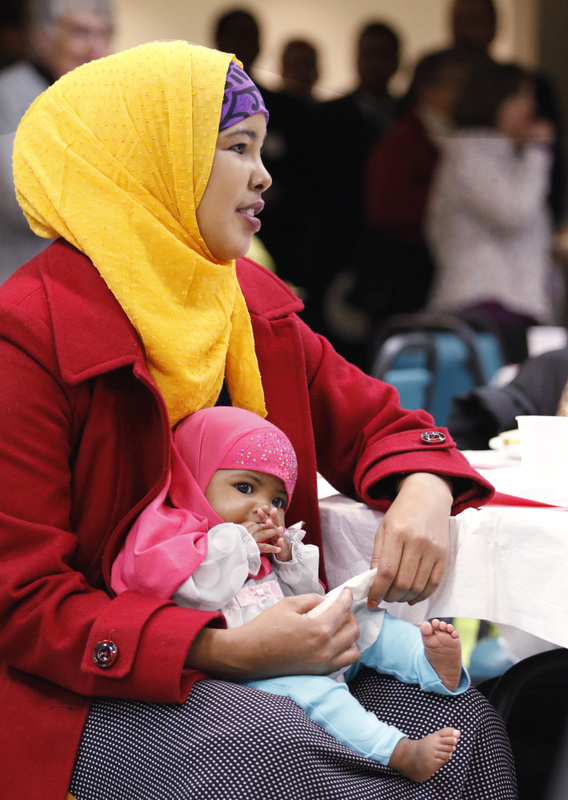 Hosna Sheikn of Lewiston holds her 3-month-old daughter, Ibtisam Afrah, during the dinner. Participants of all ages included refugees and other immigrants from Iraq, Lebanon, Somalia and the Democratic Republic of the Congo. So the parishioners of St. Maximilian Kolbe Roman Catholic Church were treading in well-worn footsteps on Sunday when they hosted a Building Bridges dinner to promote fellowship between natives and newcomers in Greater Portland. About 250 Christians, Muslims and others got to know one another a little better Sunday evening over mounds of aromatic rice, roasted chicken, stuffed vegetables and golden pastry filled with spicy beef. Participants of all ages included refugees and other immigrants from Iraq, Lebanon, Somalia and the Democratic Republic of the Congo. Middle Eastern music played and some people danced. The parish organized the dinner following President Trump’s recent crackdown on refugees and undocumented immigrants, but it was in the works for more than a year. Henchal, who also is pastor of St. John and Holy Cross Parish in South Portland and St. Bartholomew Parish in Cape Elizabeth, got the idea when he heard a radio news report that said many Americans feared Muslim immigrants, but few Americans had actually met one. Elizabeth Campbell, a parishioner who headed the dinner effort, said the gathering was an opportunity for many church members to offer a more welcoming experience than their ancestors received when they came from Ireland, Italy and other countries decades ago. The dinner was planned with help from Zoe Sahloul, executive director of the New England Arab American Organization in Westbrook, and her husband, Walid Moumneh, a business analyst who works in information technology at Idexx in Westbrook. The couple came from Lebanon to Maine 20 years ago and are raising three children in Falmouth. Moumneh noted that the tradition of fasting among Muslims helps believers grow closer to God, appreciate what they have and feel compassion for others who suffer without. Sharing a meal allows people to open up, reach out and communicate. Bishop Robert Deeley of the Roman Catholic Diocese of Portland praised the dinner as a way to show support for and solidarity with the Muslim community at a time of uncertainty in the United States. Mike Audet, 78, a former WGAN-AM news anchorman, attended the dinner with his wife, Frances. Audet found his French-speaking skills came in handy sharing a table with Nende Makyambe, 37, a refugee from the Democratic Republic of the Congo. “I can’t imagine what it’s like to come from a war-torn country to a place where everything is different,” Audet said. Makyambe, who is Christian, attended the dinner with three of his four children. His wife was at home in Portland with their youngest. Makyambe and his family came to Portland eight months ago from Tanzania, where they lived for the last 20 years, waiting to come to the United States. There, he worked as a mason. Here, he works in the packaging department at Shipyard Brewing Co. in Portland. Makyambe said he was surprised and pleased to see Christians and Muslims socializing and getting along.